Until 1977 the ‘Top of the World’ had only been visited by a hot air balloon and a submarine- but never a ship. 51 years after the first verified visit on 12 May 1926, by Norwegian explorer Roald Amundsen (who also reached the South Pole on the 14th December 2011 and transited the Northwest Passage 1903-06) a ship finally made the voyage. 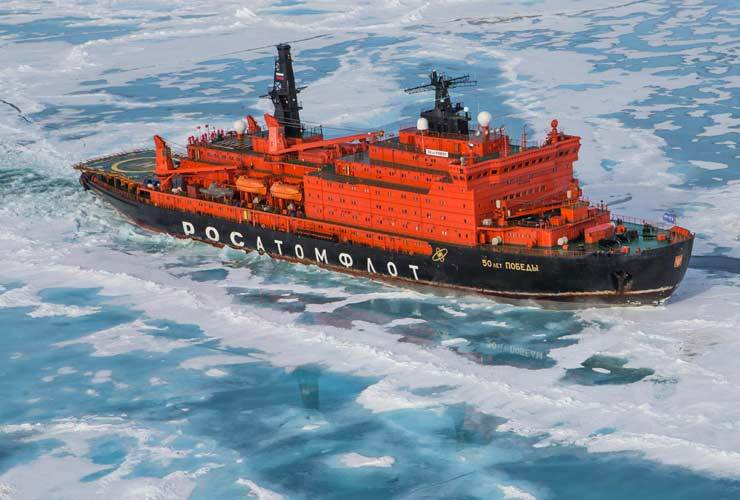 The Arktika was the first in a fleet of Russian nuclear powered icebreakers that made the 1977 trip. I was travelling on a later, more powerful version- the 50 Years of Victory. I’ll stick with the theme of power for a moment. For those of you who’ve travelled on an ‘ice-strengthened’ ship with maybe 7,000 horse-power, the power generated by the reactors on the 50 Years of Victory is 10x greater- an incredible 75,000 horse-power. It’s this incredible power, combined with bow design and weight (25,000 tons as opposed to 6,500 tons), that enables this ‘beast’ (possibly not polite given the ship is a she) of a ship to bludgeon its way through sea-ice up to 3 metres thick all the way to the Pole. The power first became evident as we crossed the Barents Sea at 18 or 19 knots. My voyage started in the Northern Russian port of Murmansk, a city with a powerful history having been one of only eight Russian cities that withstood the Nazi invasion. 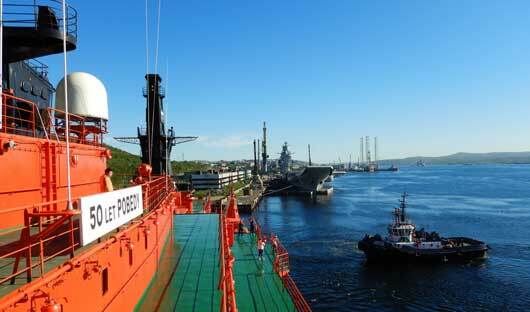 The voyage leaves from the Atomflot Port, home to Russia’s nuclear-powered icebreaker fleet. 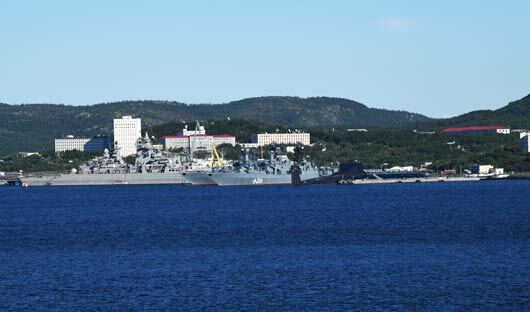 Soon we were cruising past the home of the Russian Navy at Severomorsk. We spot frigates along with their nuclear powered submarines. Not long after passing the Navy we were out of Kola Bay and into the Barents Sea. 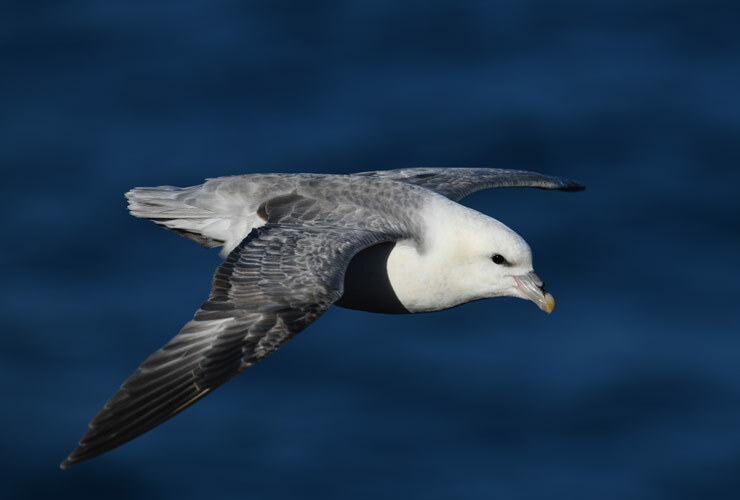 We spotted a few humpback whales and were escorted by the Northern Fulmar (the closest the Arctic has to an albatross) and black-backed and herring gulls. Our path took in Tikhaya Bukhta a former Russian Base, in Quiet Bay, in the Archipelago of Franz Josef Land. Here we encountered our first sea-ice. The pancake ice was quite substantial, other ships I’ve travelled on would have had to slowly nudge a way through or even find a way around, not the 50 Years of Victory, the captain didn’t even slow – 18 knots – get out of the way…. Our first ‘stop’ was Rubini Rock, formed of Basaltic columns, and the home to thousands of Brunnich guillemots and black-legged kittiwakes and a smaller number of glaucos gulls and little auks. Suddenly the call rings out ‘polar bear’. On the sea ice close to Rubini rock a female bear has recently killed a seal, she, and her 5 month old club, seem to find us ‘interesting’. The female comes closer and closer. 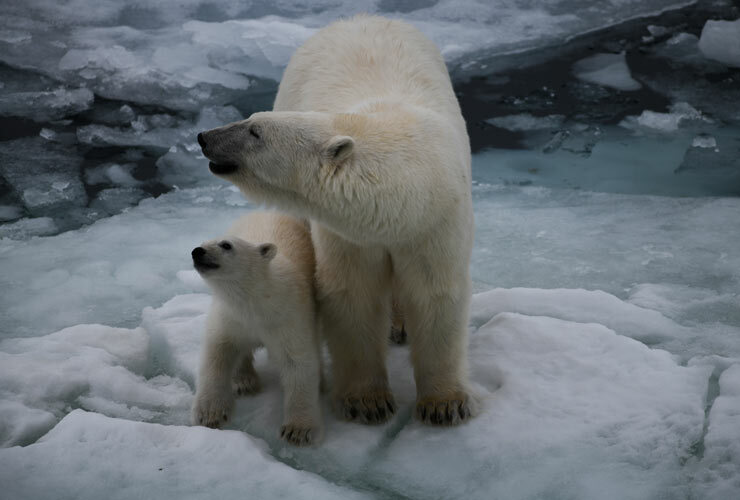 Her cub, wary at first, joins her; only to decide to turn tale and put a little more distance between us. The next day we reached the southern edge of the sea ice, yet again the ship didn’t slow or deviate – straight ahead she plunges into the sea ice. 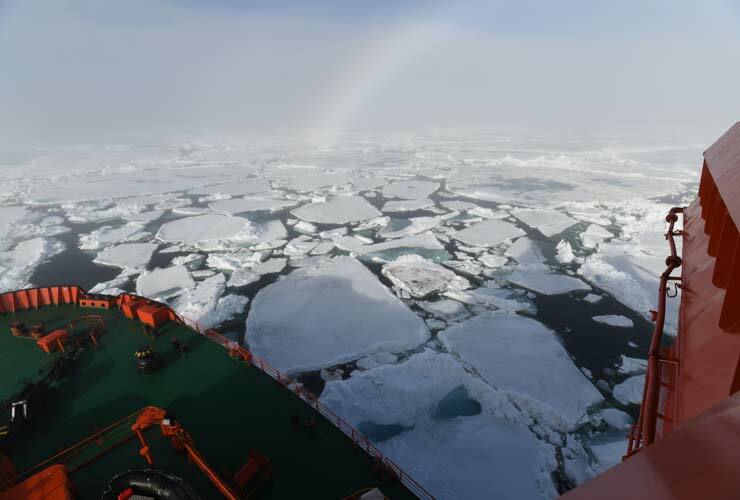 For the next two days the ship crushed the ice, in part taking the same route as she came back from the pole (this was the third voyage of the season, there are 5 voyages in June & July), at other times forging a new route (as the sea ice is continually moving). Twice we slow and despite her incredible power we stop, reverse and take another path. I am mesmerised by the sight and sound of the ship breaking the ice. 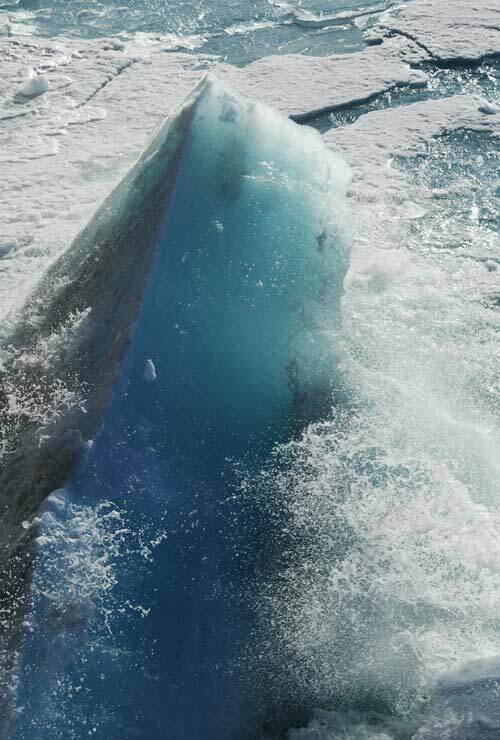 Huge slabs of ice heave into the air and then slowly sink back, occasionally shards of ice and water are thrown thirty metres into the air and infrequently the ship hits an especially hard ridge of ice followed by a boom and a shudder that passes through the entire ship. I am mesmerised by the sight and sound of the ship breaking the ice. 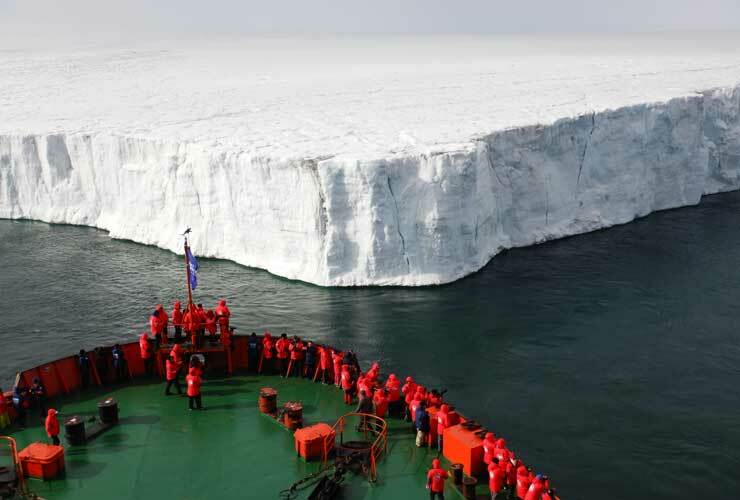 Huge slabs of ice heave into the air and then slowly sink back, occasionally shards of ice and water are thrown thirty metres into the air, infrequently the ship hits an especially hard ridge of ice followed by a boom and a shudder that passes through the entire ship. The shuddering is a constant for the next four days, after a while you simply don’t notice it. Time out of deck is interspersed with presentations, and visits to the gym (basketball, table tennis and badminton are all played). Helicopter flights are offered depending on weather conditions. Luckily we had one opportunity to fly over the ship as it was ice-breaking. The 6 minute flight was wonderful; my advice is to take some time to look around, not just through your camera. Our thoughts turned to achieving our goal – the top of the World. 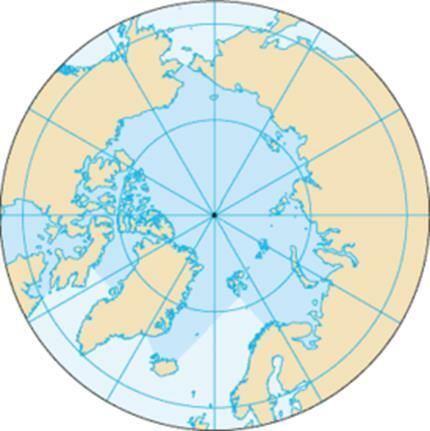 As we have 24 hours of daylight we are told we’ll be reaching the North Pole between 9-11pm. We get dressed and head out on deck as we’re told 2 miles to go. 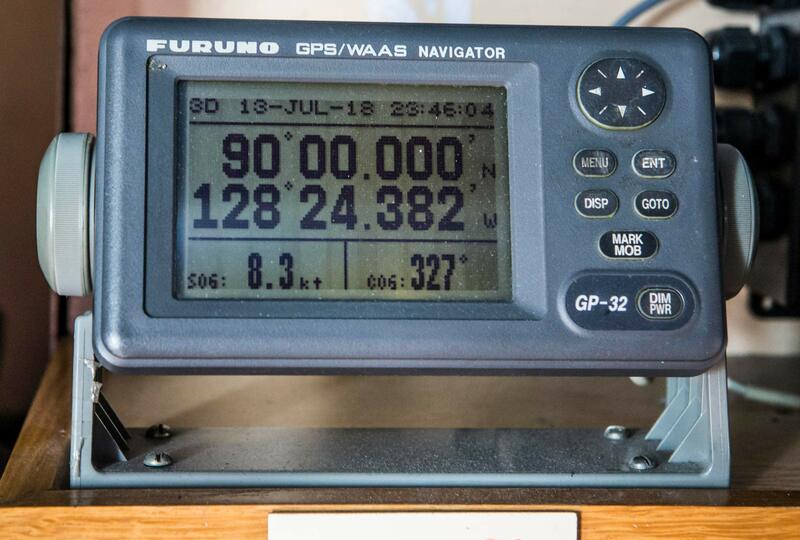 With 1 mile to go, glasses are charged and minutes later the ship’s horn blasts as we achieve 90 degrees North! Celebrations are held by all. We head to bed buzzing anxious to get a good night’s sleep as the next day we’ll be busy at the North Pole. 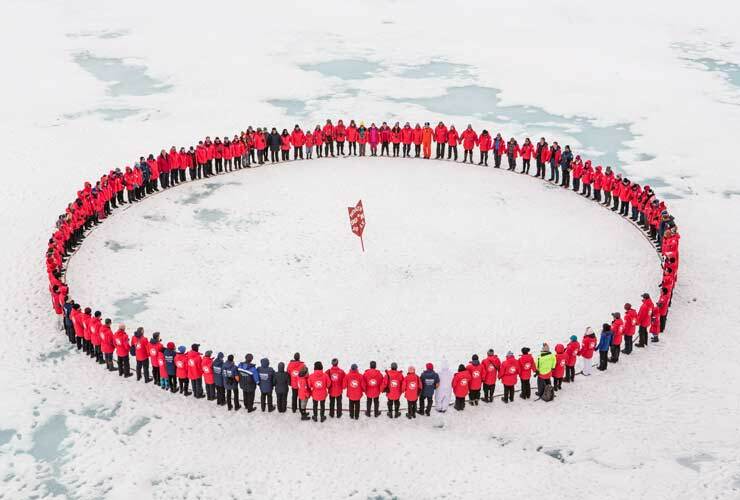 After breakfast we head out onto the sea ice and all the passengers join hands and form a circle around the Pole. The next few hours include a swim (accompanied by a ringed seal and in water that is 4,231 metres deep), a BBQ, a game of Frisbee, numerous photographs (‘pulling’ the ship, standing on the 7 tonne anchor, with the North Pole sign…) and a hike. All the while we have Russian National Park guards keeping watch for polar bears. I ask ‘have you ever seen any here?’ Apparently the last time was in 2009, so yes. 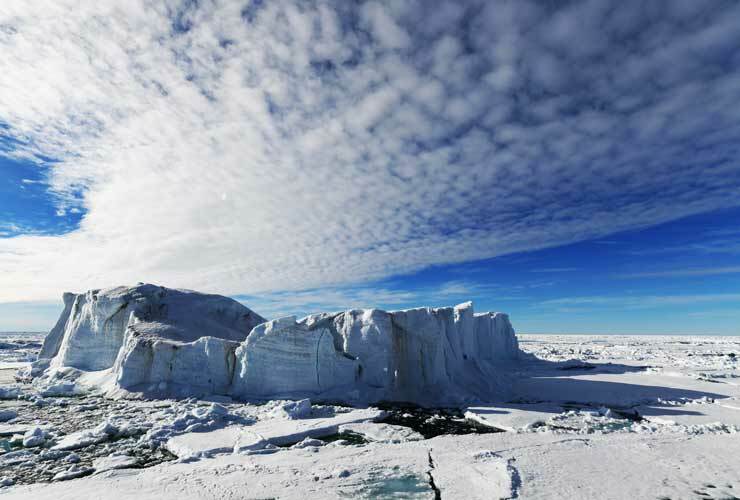 Cameras, phones and drones have all secured our time at the North Pole. The ship does a three point turn and we head south (all ways are south from here), next stop Franz Josef Land. The next two days I spend as much time as possible on the look-out for signs of Polar bears. I spot numerous tracks and later I spot a bear way off in the distance- a soft yellow, as opposed to white. I head to the bow of the ship for a view closest to the ice. At 87 degrees north a large male is patrolling (about 700km from the nearest land) numerous seal hall out holes. Obviously seals use these holes often enough for bears to make enough kills to live out in this frozen wilderness. A few kilometres further on and we spot another bear. After another day travelling through amazing ice-scapes, we reach the edge of the sea ice and later that day Franz Josef Land, an archipelago of 191 mainly ice-covered (85%) islands. The archipelago was given its name in 1873 by the Austro-Hungarian North Pole Expedition, led by Julius von Payer and Karl Weyprecht, after the Hungarian Emperor Franz Josef I. 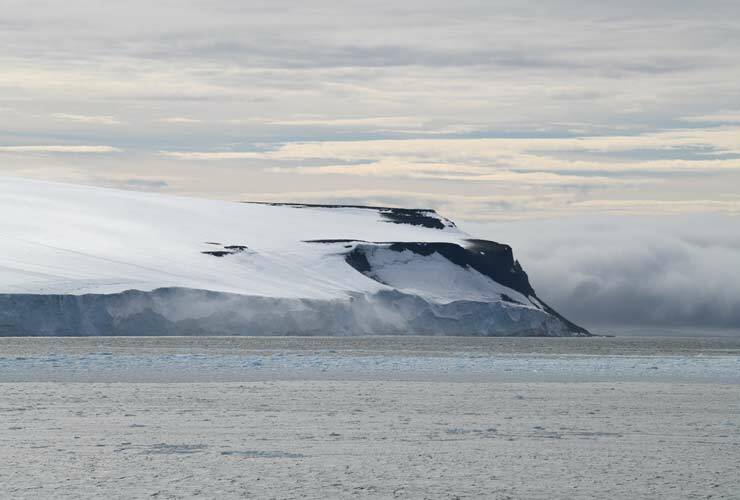 191 mainly ice-covered (85%) islands make up Franz Josef Land. The archipelago was given its name in 1873 by the Austro-Hungarian North Pole Expedition, led by Julius von Payer and Karl Weyprecht, after the Hungarian Emperor Franz Josef I.
Excursions by zodiac or helicopter from the ship are limited by sea, ice and wind conditions. All of which can change quite quickly. Our first zodiac excursion was at 1.30am. As I’ve mentioned at this time of year we have 24hrs of sunlight. 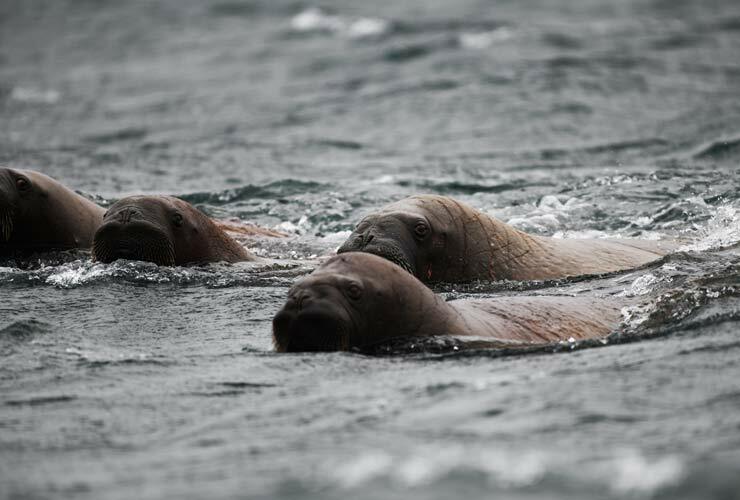 The island we set out to explore is often a hall-out of many walrus. From the ship I counted over 60 (on land and in the water). Whilst watching the walrus, I again here the call-out ‘polar bear’. A female bear discloses her position by getting up to stretch and roll. We try several positions with the ship to achieve a sheltered gangway. Eventually found we wait our turn to climb into the zodiacs. It’s cold, the wind is picking up, as is the sea. The leeward side of the island offers a little more shelter, several walrus rise up to take a look at us ‘visitors’. Photography is not easy (keeping the salt water away from my camera is a challenge). The female bear is lying down, presumably in a more sheltered spot. 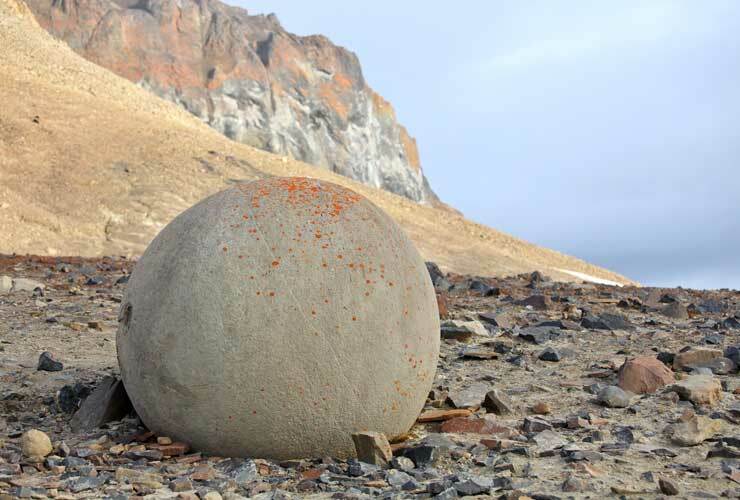 We try to visit Champ Island, famous for large stone spheres found on the shore as well as massive bird cliffs and an enormous glacier. As we near the Island we spot another bear, this time easy to pick out as he’s walking around on ground clear of snow and ice. The wind is strong, almost gale force so no helicopter or zodiac trips are possible. We can see the largest of the stone spheres (apparently many hundreds of the smaller stones have sadly been taken as souvenirs). 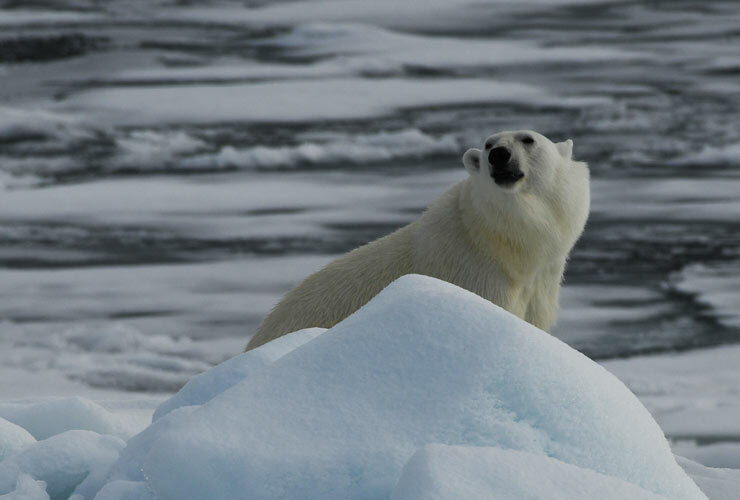 I love searching sea-ice for polar bears, I guess I enjoy finding any wildlife; and polar bears are such stunning animals that the reward is significant. Fortunately, given the high winds and no chance of landing either via zodiac or helicopter, I find two, one quite close. 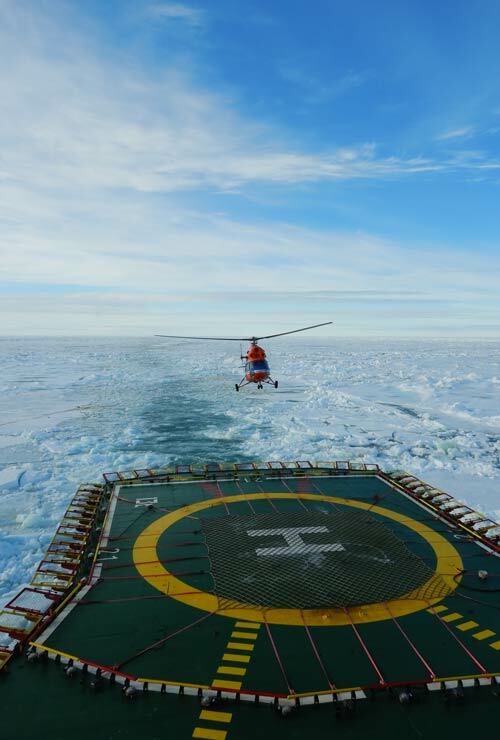 Our captain slowly maneuverers the ship closer to the sea ice and the bear. At first the bear ‘hides’, and not long after it appears that our smell (a polar bear’s sense of smell is very good, scientists believe they can smell prey up to 30kms away) lures him out (we can tell it’s a male as he has a slight ‘roman’ nose and longer hairs (feathers) on the back his legs). 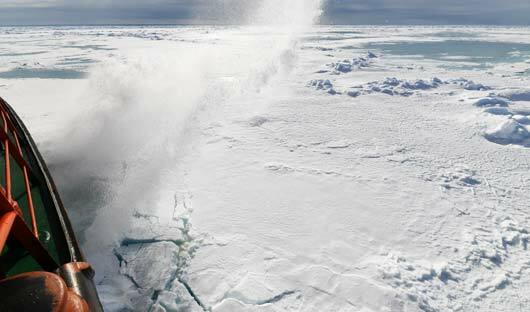 Over the next, spellbound, hour the bear walks on the sea ice for the length of the ship. Often stopping to look up and sniff and gaze into our eyes – simply wonderful. Back on-board a cup of coffee warms me up and I’m soon asleep. Here it’s worth commenting on life on-board the ship. The 50 Years of Victory is a working ship. 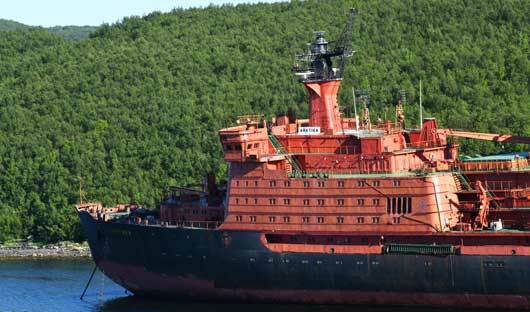 In winter (October through April) she keeps the North-east passage open for freighters. The cabins we are in would normally be used by the senior ship’s crew. They are simple, practical, warm and comfortable. 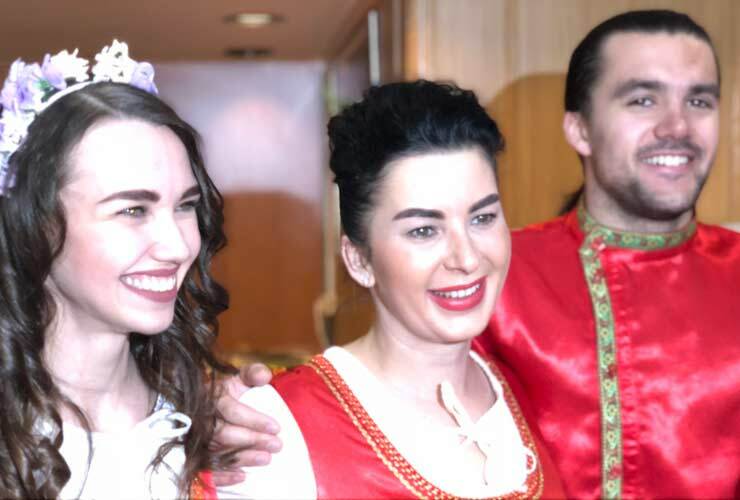 The dining room team is excellent; English speaking Russian young men and women – mostly from St Petersburg. They are well trained, friendly and happy and add to the feeling of making all the guests feel very welcome. The food is good, you certainly won’t go hungry. Afternoon tea and cakes, freshly baked on-board, ensure no one gets hungry between lunch and dinner. 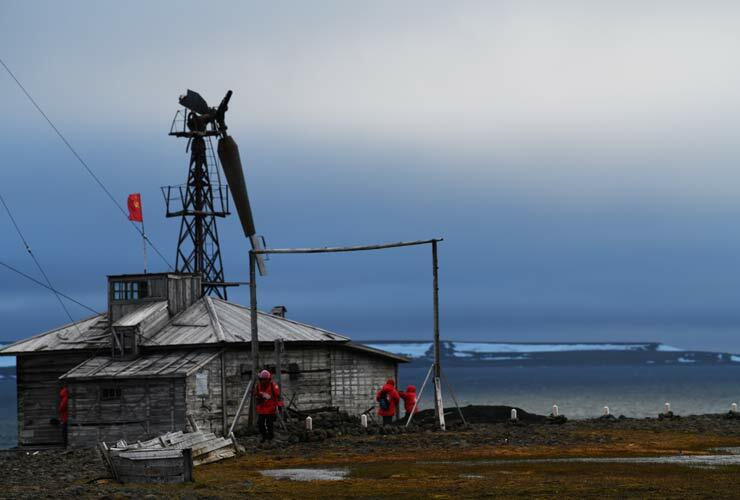 We cruise south through Franz Josef Land, making an excursion at Tikhaya Bukhta, dropping off some timber to help restore the huts of this Russian Station (1914) and our Russian National Park guides. The ship is soon cruising at 18 knots in calm seas. On our voyage back to Murmansk we see many whales (more humpback and a Fin) and dolphins. Using the updraft created by the ship we have kittiwakes, gulls, Arctic skuas and fulmars, and the occasional gannet, sailing south with us. Two days later we slow as we enter Kola Bay and cruise calmly back to Atomflot port. At 8.30am we bid farewell to our hosts and board a bus back to Murmansk airport where I fly onto St Petersburg. It was an incredible journey on an incredible ship. I combined my voyage to the North Pole with a few nights in Helsinki on my arrival and St Petersburg, the Venice of the North and a most ‘un-Russian’ city, on the return journey. Despite many older web sites talking about difficult/long immigration procedures, both my entry and exit of Russia were simple and efficient. ‘Nosdrovia’ (and to be correct Na Zdorovie) – Cheers in Russian. I travelled with one of our specialist polar operators/partners Poseidon Expeditions.